A LiveFree house is an unique house where mobility is combined with quality and durability. On top of that the houses are comfortable and have a luxury appearance. The house is very light, using a sandwich construction with high insulation value, and therefore needs limited foundation provisions. 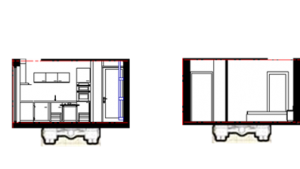 The house consists of connectable parts and an energy unit that all can be transported by truck. This way the houses are easily transportable, they can be used on a location where at that time it is needed and keep there value. By applying an intelligent energy unit the house can operate more or less depending on utilities connections. this makes the house very suitable for temporary housing and the Leisure market.